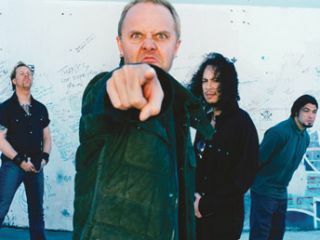 Who is Lars pointing the finger at? Robert Trujillo has been in the band for five years now, but forthcoming album Death Magnetic, released on 12 September, sees him feature on a Metallica studio LP for the first time. What's more, frontman James Hetfield claims Trujillo has "already contributed more" than predecessor Jason Newsted did in 14 years. Speaking to VH1, the other members of Metallica were also quick to praise Trujillo. Lars Ulrich: "It's difficult to praise Rob without insinuating that there was something not great about his predecessor. I've got nothing but respect and love for Jason. But Rob, he's been with us five years now, and it's completely effortless. It's never felt this complete." "His chemistry, his personality, it just all fits in really, really well." "He is very gifted, very fast, and he kind of just fits in. He's such a gifted musician, and Rob spent a lot of time being the third wheel in the Lars/James songwriting (process), and he was great to bounce ideas off of and to come up with a great suggestion when me or James would get stuck." "Sometimes I look over at him, and he's playing his bass onstage, and it feels like he's always been there - his chemistry, his personality, it just all fits in really, really well." Indeed, this video clip arguably proves that bassist Robert Trujillo can show his bandmates a thing or two about guitar playing too. Death Magnetic is preceded by lead single The Day That Never Comes in late August.